As a homeowner, you try to combine looks with functionality and durability in every appliance and fixture you select. What good is having something look good if it doesn’t hold up under daily living as well? 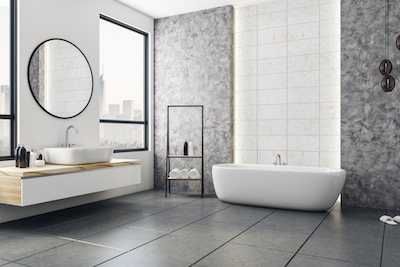 Bathrooms are one of the most challenging rooms in your home to achieve it all. People often sacrifice looks for functionality. You know the beloved hardwood flooring that you have throughout your home wouldn’t hold up to the pressure of bathroom activity, so you forgo it and select something else. Resilient flooring replicates the look of the flooring you love the most, and makes it waterproof so they won’t sustain water damage even in the toughest of conditions. Resilient flooring gives you the hard surfaces you love while giving you the durability you demand, all at an affordable price. You’ll find resilient flooring in both luxury vinyl and in waterproof composite flooring. But these aren’t your parents’ flooring choices. Instead, they come in plank and tile format and mimic the look and feel of other flooring you have throughout your home. They look authentic; they feel authentic. Resilient flooring is designed both as planks and tiles, and is created to be installed using interlocking technology. When you lock the tiles into place, it prevents liquid from penetrating below the flooring, and into the subflooring. It can protect against daily living activities, such as moisture and humidity from showers, as well as from disasters like a flood. Of course, nothing can withstand standing water for extended periods of time, but it’s nice to know that if your kids “accidentally” leave the faucet on, your floors won’t be ruined from one mishap. When you look at luxury vinyl and waterproof composite flooring, you’ll be surprised at the look and feel of your choices. But there are even more reasons to fall in love with resilient flooring. The designs are made to replicate the most popular flooring choices on the marketplace, including wood, stone, and ceramic. Resilient flooring is resistant to scratches and stains. While you may have the look of real wood and stone, resilient flooring is much softer underfoot. This is perfect for homes with kids, pets, or elderly family members. Because resilient flooring is waterproof, it also is safer when wet. That means less chance of slipping as you’re stepping out of the shower or tub. Resilient flooring is very durable and easy to clean. That’s another plus if you have a busy household that’s always coming and going, and you don’t want to spend hours each week taking care of hard-to-care-for flooring. If you’re ready to upgrade your flooring now, and are thinking of adding waterproof flooring in the most difficult rooms in your home, you’re in luck. We have a wide variety of resilient flooring choices, with patterns, colors, and choices to please everyone. Let one of our consultants help you create a look and feel perfect for your living space.